Be honest with me for a few moments. Are you one of the people that will look at your pencil case, see how organised it is and say, “Wow, I’m so OCD!”? Or are you someone who gets scared by people playing harmless pranks and you say to that person who just performed that prank on you, “I had a panic attack when you did that!”? For a while now the stigma against mental health and the use of mental health conditions as adjectives has wound me up to the extreme, because it’s so offensive to people who have mental health conditions. Before I go on, if you are a culprit of that, I’d ask you to stop. But with Holly Bourne’s new book, Am I Normal Yet?, I judged it by the author a bit too quickly. The Manifesto On How To Be Interesting was the second book I reviewed for this site and I loved it. So perhaps I judged the book a bit too quickly, but nonetheless it lived up to the expectations I set of it. Evie has OCD. Severe OCD. Throughout her life she’s been on medication and in therapy for it, but now her dosage of medicine is falling and fast. And it’s about time too: she’s 16 and heading into college. All she wants is to finally feel normal. Go to normal college was one, and now she has Lottie and Amber – friends who won’t ditch you is another. But she wants to have a normal boyfriend too. Is that too much to ask for? Whereas I found The Manifesto On How To Be Interesting to be a fun, kind of easy going read, Am I Normal Yet? is a lot more hard-hitting, and some readers might not like the fact that I think this book shows a completely different side to Holly Bourne’s writing, but I personally really like it. Evie as a character shows a real struggle that sufferers of OCD face every day. To many they appear normal, and as though absolutely nothing is wrong at all with them. But the book utilises the cliché NHS therapeutic techniques and the whole good/bad thoughts to highlight the real issue of mental health and how people actually go about their day. That rant I had at the start? Holly had it too in the book under the guise of Evie. That should highlight to you that this isn’t just a little thing I feel: it’s a movement. Evie and her companions all make for a typical teenage life (presented beautifully), and in a way Am I Normal Yet? is just that: it’s a teenage girl living life. The fact that it is just a book that shows a teenage girl living life again highlights that OCD is a trait, it is not a person. Put simply, all that is a long way of saying: this book is a stigma buster and I love it for that. Plus Holly could be bothered to tell me stuff about the characters, so no “I want more detail!” rant this time! 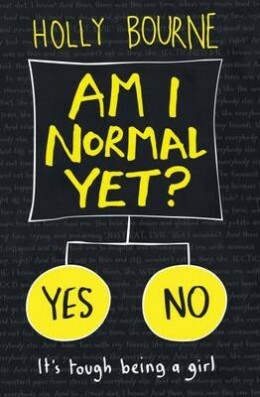 Holly, I genuinely loved this book, and I did notice that you called this the Am I Normal Yet? series. So I eagerly await the day your next book hits bookstores.